Paragliding is 5-10 minutes of flying and the glider is controlled by a trained pilot. The experience is the closets one can get to feel like a bird. 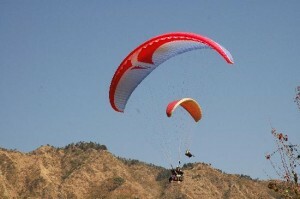 It taking wings and soaring with the birds takes your fancy, Paragliding is available at Naukuchiatal. Naukuchiatal is 23 Kms, away from Nainital. It is a beautiful nine-cornered lake, which is also ideal for fishing and migratory bird-watching.